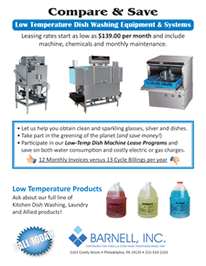 Barnell, Inc. is a convenient and cost-effective single source for all your company’s warewashing, housekeeping, laundry and maintenance cleaning needs. Barnell products and services always incorporate the latest industry innovations in chemical formulation, equipment, systems and methods. Our low-temperature dish washing machines consume only 1 to 1.5 gallons of water per cycle. Water needs heating to only 140 degrees, rather than the 180 degrees required by a hot dish washing machine. Recent improvement to our low-temperature detergents will produce sparkling clean dishes even if your water quality is less than ideal. 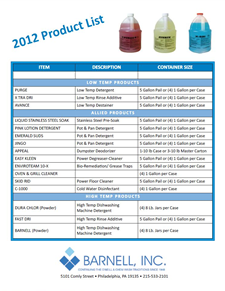 Here’s a brief summary of the markets and applications currently addressed by Barnell, Inc. products and services. Of course, don’t hesitate to call us with any questions you may have, or if you would like to discuss your organization’s unique requirements. Powdered repackaging from bulk totes into bags and drums, in addition to liquid blending and repackaging for bulk tank wagon business.